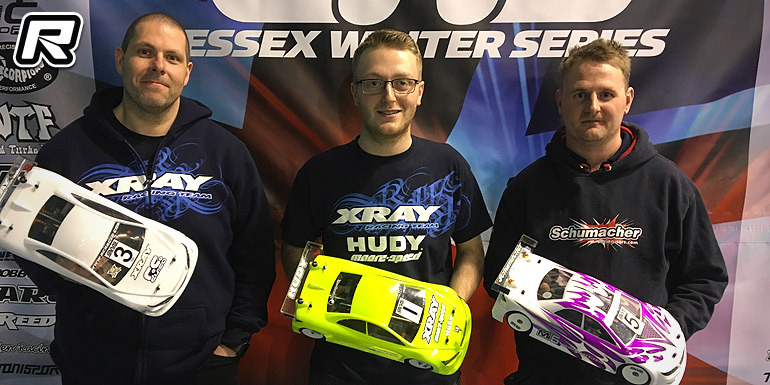 The penultimate round of the Essex Winter Series championship took place this weekend at the popular venue in South-East England. Despite the freezing temperatures outside, the fully heated hall and pits saw most racers resorting to t-shirts and the track groove up quickly. With Championship leader, and winner of all three events so far, Elliott Harper on international duty for Schumacher, others would be hoping to take advantage and a useful points haul from the day. Olly Jefferies would be the one to make the most of that – despite tough competition, the Xray driver went on to top all four of the qualifying rounds. However, behind Olly, tight battles for the remaining A-final places raged throughout each run. Infinity’s Andy Moore, running the Infinity prototype touring car for the first time in the UK, was Olly’s closest challenger in the opening qualifier, ahead of Olly’s Xray team mate Alexander Hagberg, the Team Associated cars of Chris Grainger and Alan Bickerstaff, and Kyle Branson, also running the new Infinity car. Q2 saw Andy again finishing second, with the top six in an identical order to the first round. 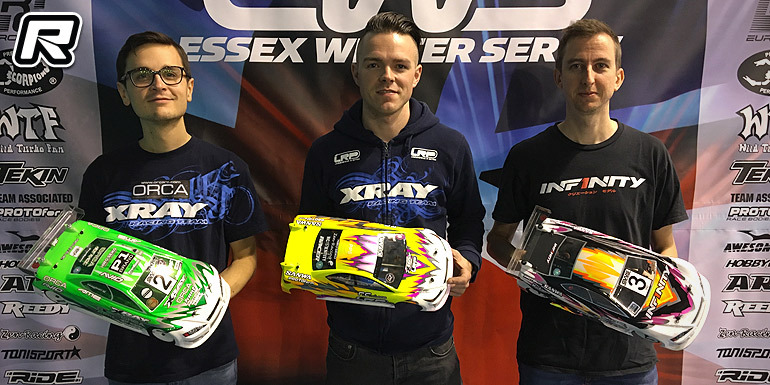 The third qualifier had Alexander providing the strongest challenge to Olly so far, but still finishing up a little short and thus taking second in the round, with Andy third, Matthew White (Team Associated) fourth and Alan fifth. The final round once again saw Alexander claim the runner-up spot, with Alan third this time, Matthew fourth again ahead of Andy. Whilst the first three starting cars of Olly, Alexander and Andy made a great start, a busy few laps saw Kyle the main benefactor, moving up to fourth ahead of Matthew. Harley Eldridge, the star from the previous round of the series, took advantage later in the race to move into fourth, from where she had a somewhat lonely run as Stefan Chodzynski, now running a privately entered Schumacher, up to fifth, had a high speed freight train form behind him, and thus had to focus on defending the position rather than attacking the star youngster’s Yokomo. Out front, Olly controlled the pace, managing a gap of around one-second to his Swedish team mate, whilst Andy Moore remained around one-second further back and took home a very respectable third place for his car’s debut. The result sees Andy and Olly now tied for second in the Championship, four points behind Elliott. With the final round of the series having to count towards the overall total this year, it leaves both needing some help if they are to un-seat Elliott and prevent him from taking back-to-back titles at EWS. In the Super Stock class, the Championship is looking more and more likely to be a show-down between Zak Finlay and Tony Broad. With Tony dominating the previous round of the series, it was Zak’s turn to take the upper hand this week, and he did so in style by winning all four rounds of qualifying with his Xray. Tim Hancock and Tony (both Xray) would be best-of-the-rest in the first qualifying round, ahead of the Awesomatix of Richard King, and Marcus Askell’s Xray. The second round saw Tony put in the second best time, in front of Marcus, Richard and Tim. Q3 once again had Tony as the closest challenger to Zak, with Tim third and Schumacher’s Ashley Wiffen fourth ahead of Richard and defending series champion Jimmy Maddison (Xray). The final round had Marcus taking the second best time, Tony third and Ashley fourth once again. The A-final saw two races develop at the front of the field – firstly a race for the lead, with Zak leading Tony by around three-quarters of a second, and a race for third, with Marcus, Tim and Ashley squabbling over the last podium step. Ashley managed to pass Tim at the half-distance marker, whilst out in front, Tony couldn’t close the gap to Zak, allowing the factory Xray driver to run out the winner. However, despite everyone’s expectations, there was drama on the final lap as Tony’s car ground to a halt just one corner from the finishing line, an expected drive-train part failure, as he wasn’t even able to coast the final few meters to the finish line. This dropped him to fifth, and allowed Marcus to take second and Ashley third overall. This leaves Zak with a two-point Championship lead, setting up a proper shoot-out for the Final Round with Tony to decide who will lift the title. 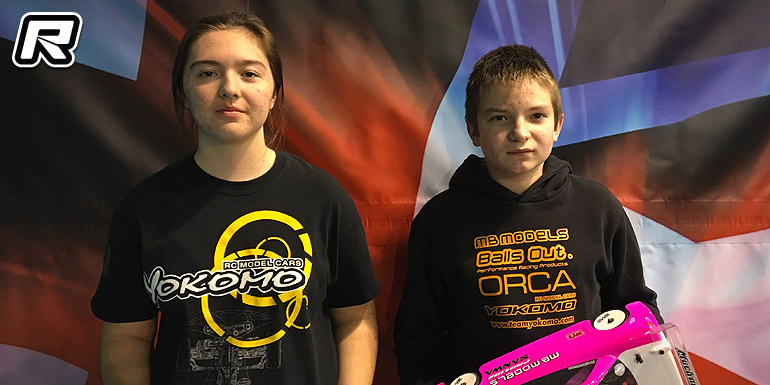 In the Junior divisions, Harley Eldridge once again was the best in Modified, thanks to her A-final placing, with Adam Southgate best in the Super Stock class with his C-final result. The series concludes on 12 February, where the Champions will be decided.